Jammu and Kashmir have the lowest road density in India, but still a considerable increase in new vehicles has been recorded. Two-wheelers are a popular mode of transport in Srinagar. Taking the bike on the road can pose dangers of an accident whether there is unrest or not. Accidents on the road can result in expenses for self injuries, damage to own vehicle, and damages caused to a third party. As per the motor laws of India, it is mandatory to have a liability-only policy on your two-wheeler. However, these policies only cover third-party liabilities. If you incur costs for own damage, then you need to have a comprehensive policy. Many insurance companies perform in the top ranks and provide customers a plethora of options that are designed specifically for different customers. Since there is an abundance of insurance companies flourishing in India, customers in Srinagar can opt for a two-wheeler insurance policy from any of these companies. Simple Process - The customer can contact the insurance company through the customer care. Once the claim is approved, the garage and the insurer will handle the rest between themselves. There is minimal hassle involved with cashless claims. Less Expensive - Customers only need to pay for any part of the bill that is not covered under the insurance policy. Customers also do not have to bear any expenses for visiting a branch and filing for a claim. 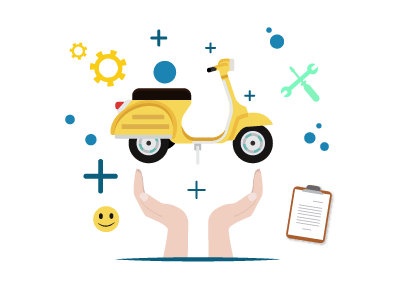 In order to legally sell your bike as per the prevailing norms, the ownership of the bike must be transferred so that the buyer becomes the new registered owner. Once this is done, you will not be responsible for any liabilities that may arise in connection with bike in the future. To complete the legal process, one must visit the Directorate of Transport. Fill up an application (Form 29, 30) and submit the required documents. Once the concerned authority verifies the details, the ownership will be transferred. A fee of Rs.30 is charged for the transfer. Contact the insurance provider and inform them of the sale of the vehicle. Request them to transfer the name of the insurance policy to the new owner. Details and documents of the new owner needs to be submitted.